My birthday present from me to myself! My birthday. All day on an airplane, flying first to Amsterdam and then with KLM to the Kilimanjaro airport (8 hours), where most tourists got off the plane, while a bunch of other ones got on, and then to Dar Es Salaam, my final destination. Strangely enough, there were only Gringos (or Mzungus as we are called in Swahili) on board and only a handful of Africans. At the airport, Tuyu was a bit late. She had already been to the airport a couple of hours earlier to see off her family and after finding me she inquired about their delayed plane leaving after all. After getting affirmative news, we hoped in her car and drove to her sister's house. All along the drive I was reminded of South America. Not just because of people's driving style and the omnipresent smell of diesel fumes, but also the little shacks and stand lining the roads with locals trying to sell stuff to the passing and normally better to do motorist. Few cars had all four lights working and a broken-down truck was not marked by flashing lights or similar warning methods, but by a bunch of branches on the road, which forced traffic to slow down enough before smashing into the stranded vehicle. Tuyu's sister (Nango) belongs to the group of better-off Tanzanians. She is married to a German (Sebastian from Wuerzburg) and together with their nine year old daughter (Shinna?) they live in a fairly big house directly on the beach in a gated community. The enclave included not just a watchman at the main gate, but also a night's watchman for each house, which were almost exclusively inhabited by Mzungus. But everybody was already asleep by the time we got there and after drinking a beer and talking for an hour or so (and having been bitten by plenty of mosquitoes) I crashed under the mosquito net. Early next morning I saw it getting bright outside, but I was waiting for the sun to illuminate the room to get up. The noise in the kitchen was getting louder and louder and eventually I got up to check up on what was going on. I had expected the sun at 6 and since it still was not there I wondered who was being so active, so early in the kitchen. Well, it was 8:15, everybody was already up and the sun was hiding behind some clouds, thus no illumination. We ate a quick breakfast (pineapples, papaya and toast) and packed our stuff before heading out. At a nearby gas station we filled up on gas (of course, gasoline again is more expensive than in the United States at $1.20 per liter) and after an hour heading west we arrived at the intersection where the third Mzungu (or the second one, really, Tuyu not being one), Mathias, a Swiss working for a year for an NGO in Tanzania and wanting to make Kili his farewell trip, was waiting. He had come early in the morning from Ambato, which by the way is the capital, not Dar es Salaam. Once we stopped in front of the restaurant he was waiting at, we were immediately surrounded by dozens of people (mainly teenagers) wanting to sell us souvenirs, drinks, cashew nuts (which we bought), fruits, etc. Again a South America deja-vu. We drank a coke before also packing Mathias' stuff into Tuyu's already full jeep and then headed north on the main highway connecting Dar with Moshi, 7 hours away and our starting point for the climb. The drive there first led through fairly flat territory, with few high trees but lots of brush. It was really savannah-like vegetation with small houses and shacks lining the road. We saw some monkeys but little other wildlife. One of the features of the drive was definitely the bags of charcoal that were popped up along the road. Both Tuyu and Mathias knew much about the charcoal production and were eager to discuss the topic, because it relates to some of the research they are doing. Apparently wood (all kinds of it, including hard wood) is being processed into charcoal by the locals, who then place it besides the road for truckers to pick it up and sell it in Dar or other more urban areas as fuel. They buy it for about 7000 shillings, but then mark up that price 4-5 times when selling it to the city inhabitants. The problem with all this is that it is little sustainable and based on the work by T. Mwampamba, who ran a bunch of scenarios, wood for that purpose might run out by the year 2027 in the most pessimistic case (2007). We continued. Tuyu's reckless driving caused her to get pulled over by the cops two times (or was it three times, I cannot remember, but it would not be surprising at all either). Once they just checked everything on the car, lights, horn, fire extinguisher and found not violation. The second time she just flirted her away out of the predicament. The third time though she had been too fast and the cop with the radar gone even showed her the offensive speed on his device (78 km/h in a 50, I believe) and this time there was no escape. 20,000 shillings poorer and five minutes later we drove on. After a three-hour drive we stopped for lunch at a buffet place, which served delicious food. I already threw out my good intentions of being picky with my food (in order to be nice to my sensitive stomach) and tried a little bit of everything. After lunch we entered a more mountainous area with nice cliffs and fairly high hills lining the road on the northern side. One other feature of this landscape now we endless agricultural fields of sisal. Monoculture really. Sisal is grown for the fabric made out of it. I took over as a driver and enjoyed driving on the left hand side of the road again. A couple of hours later it was getting dark and Mathias took his turn at the wheel. Eventually we arrived in Moshi and after some difficulties finding the route to our hotel; we arrived at the Mountain Inn, our home for the coming night and one more night after the hike. It was a nice place and even offered hot water in its shower. We had dinner, talked to the lady from the agency (who informed us about the program for the upcoming 7 days) and went to bed. Dinner was chicken Massala, quite good and two beers (Safari and Serengeti). Not too many mosquitoes. I began liking this trip even more. We got up at 7am in order to have breakfast and pack our bags before heading out at 9am. We took a minibus that was organized by the tour company and stopped after an hour to pick up the 2 guides (one main guide and one assistant guide) and the six porters. Because it was Sunday, thousands of people were out on the street, either on their way to or from church. Everybody was nicely dressed and I was especially impressed by the quantity of children among all the people walking. Due to the gringo effect, we received some special attention and lots of kids were smiling, waving or pointing at the Gringos as we drove by. I took plenty of pictures out of the driving bus of all the beautiful people. Many girls and women have short-cropped hair and wear colorful dresses and head scarves. The whole country appears very young, and we hardly saw any elderly people among the crowd, which is not surprising considering that the average life expectancy is just over 50 years. After another 45 minutes of driving we stopped in some dusty hamlet for lunch. Some dude with only one leg kept begging us for money. The guides and porters told him to move on, but he was very consistent, especially since he was seeing my hesitation in not giving him anything. I figured that with only one leg he would have it hard enough, and that a few dollars that are hardly missed by me, would at least guarantee him a pleasant day, even if he spends it on booze. This was the argument given by the others for not giving him money and I ended up not giving him any. I did not eat much, but just fed off the lunch bag, which we had been given at the hotel. Two sandwiches, a hard boiled egg, an orange and a few cookies made up that lunch bag and for the next five days they would change little in their composition. After another hour of driving we arrived at the Rongai trailhead, where we signed up and divided our stuff among the porters. It was really quite pathetic again, seeing us in heavy-duty hiking boots, Goretex jackets and quick-drying shirts, carrying our 5 kg daypacks, while the porters in their sandals and 30 kg loads on their backs and heads marched off at two times our speed. Sigh! Just like on the Inca trail, another deja-vu. On the way up we had ascended through a fairly dry area at first, which was principally subsistence-agriculture based. We encountered a few poor children with their parents and their dirty clothing offered quite a different picture from the nicely dressed kids on their way to church we had seen earlier. After the dry area we marched through a few kilometers of rainforest, which opened up quickly into some sort of brushy savannah. It was here near a small stream that we set up camp for the night. The spot was nice, but the fact that 100s of Gringos and porters used the few toilet facilities, left them in a very desolate state. I already had stomach issues and had to get up several times that night to use those facilities (just a hole in the ground) and enjoyed each visit immensely. Upon our arrival, the whole place was busy with activity. Dozens of clients and a multitude of porters and guides scurried around, getting their stuff organized, signing up and taking pictures. There were loads of luggage everywhere waiting to be picked up and people kept coming and going. Apparently the Rongai route wasn't as seldom visited as we had hoped, and on the trail we passed about 40-50 Gringos going up (Tuyu leans over my shoulder and corrects me that they are called "Mzungus" as I write these lines). We hiked for about 3 hours before getting to the first camp. Our porter even carried 3 simple folding chairs up for this and while we were sitting down for tea we could observe the activities around us: Lots of porters setting up the tents for their clients and preparing dinners. Many porters speak not only Swahili, but also their local dialect, which Tuyu doesn't understand. Sure enough during the night I had a bout of almost diarrhea and had to visit the bathroom several times (a special experience in the dark as you want to pay attention to where you put your step. But I still felt rested and up to today's hike up to the second camp, approximately 1000 meters higher. We had breakfast in front of our tents, while the porters were already in the process of breaking camp. It feels quite nice if you don't have to carry anything, because as the day before the porters took care of our tent, pads, sleeping bags, etc. However, rather than carrying one gigantic backpack weighing 100 pounds, the porters rolled most of their load up in one big package, which they then balanced on their heads. Again, it was a very pathetic sight as we, the Mzungus slowly worked our way up the gradually inclining slopes with our 5 kg Packs, while the porters cruised passed us with about 10 times the weight. Right after setting out, we sort of left the brushy vegetation that had accompanied us so far and we were able for the first time to have a distinct view of Kilimanjaro to our right and its neighboring "twin" peak Mawenzi to the left. Henrich of course had to take many pictures of this nice sight. One with guides, one with only clients, one of him alone, etc. Hours later, we continued going and from this point it was clear which point we had to aim at, essentially the col between the two peaks. Kibo hut was supposed to be located somewhere up there, but that was still two days away. The more rigid looking Mawenzi is actually the first summit of Kilimanjaro, which was formed during its first volcanic activity many years ago. Then the mountain become dormant long enough for the crust of the earth, which floats on the earth's magma to shift about one kilometer. Then the mountain resumed its volcanic activity and formed its second summit, Kibo, which is today the high point, about 600 meters higher than Mawenzi. We were entering clearly volcanic landscape, and encountered numerous lava tunnels and similar holes. One such hole we reached about 1.5h after leaving camp, and we thought it would make a great camp ground. Upon closer investigation however, we found that it had mainly been used as a bathroom by previous expeditions and we ruled out the possibility of staying there. Also, it was much too early in the day to stop and we had not yet reached the altitude necessary for sufficient acclimatization and for minimizing the distance remaining for the following day. It was fairly warm in the sun and I hiked in only a fleece, but at some point, the wind picked up and I put on a windbreaker. This was during a break and I probably would have been ok, if I had continued without stopping, but I did not want to risk getting a cold. We hiked for about 4-5 hours and in the middle of the afternoon reached the place where we would spend the night. Most porters were already there and had already begun to set up the tents. There was only one other party that was camping quite some distance away. It was a British couple with their team and we would encounter them again throughout the rest of the trip. She was clearly understandable, but her husband was from somewhere around Manchester and at times I had no idea of what he was talking about. We chatted for a while but then returned to our tents, where dinner was waiting. After dinner we retired early, because it was getting cold quickly and there wasn't really much to do up there. Much more comfortable in the sleeping bags, I exchanged interesting stories with Tuju about "Gott und die Welt", before dozing off and sleeping beautifully until my first pee break at about 3am. I really should see a doctor about my prostate. I am barely beyond 30, but cannot soundly sleep for 8 hours straight without having to get up. While this doesn't bother me at my home, where the bathroom is only 5 meters away and everything is warm and cozy, it is quite an ordeal having to get out of the sleeping bag and tent in your underwear and then standing in the wind at below freezing temperatures trying not to pee on yourself. Second morning on the mountain. Again, we were awoken by the cook bringing us tea and breakfast. The sun was out already when we stuck our heads outside the tent and we slowly got ready to attack another day of hiking. Our next destination was the Kibo Huts about 8 kms and 1000 meters of elevation gain higher up on the mountain. The Kibo Huts also served as the "high camp" before setting out for the summit the following morning. We packed up our belongings and took down the tents. The porters were doing the same and soon enough balanced their bags as well as ours on their heads. It was fairly Fresh this morning, even though the sun was out, and one definitely had to put on a second or even third layer of clothing. Throughout the day I would notice, however, how many porters would only be wearing a t-shirt or just sandals without socks. This was astonishing, especially since the wind picked up later during the day and for every rest break we would try to find a spot with a bunch of boulders that would block the wind. The landscape became pretty barren and such boulders were hard to come by in some places. We set out at about 10 am and arrived at the Kibo Huts about 5 hours later. There were not too many people on the trail, except for our group and the British couple. But the quiet and peaceful scenery changed completely, when we arrived at the Kibo Huts, because three separate trails arrived at this point to make it the starting point for the final ascent and one of the three routes was the Coca-Cola or the Marangu route, which is the regular route and at this time of the year usually packed with tourists. Sure enough, even from a few hundred meters away we could see a bunch of differently colored tents that stood surrounding the few solid structures that make up the Kibo Huts. Luckily, our porters had arrived before us (as usual) and secured a nice camp spot for us. Still I found that one of the tents was too close to the "action" and I helped move it up away from the noise, because I feared that I wouldn't be able to sleep in such close proximity to the huts and since we had to get up at midnight and therefore only had few precious hours of sleep ahead of us, I wanted to use every minute of it. At this point I felt a headache coming. I had felt fine all day, but now the elevation was getting to me. I had also ventured a few hundred meters above camp just in an attempt to scout out the route for the next day and to acclimatize a bit more, but that fairly short distance had been fairly tough, because they air was getting quite thin at 4700 meters. Fearing that it would get worse and not wanting to ruin my chances to get up to the summit less than 12 hours later, I struck up a conversation with a couple of Spaniards, who were sharing my plight and offered me a couple of Diamox pills, of which I promptly took 2 before heaving supper and disappearing in my tent. Both Tuyu and Matthias felt fine. I put in my ear plugs as soon as I stretched out and quickly fell asleep. By now, Matthias had moved into our tent (it was warmer than for him to sleep in his one-person tent) and the atmosphere was quite cozy. Porters in nearby tents were having a good time all evening, and making quite a lot of noise, which woke me a couple of times despite the ear plugs. They had already reached their highpoint and could therefore celebrate, but for the poor clients that still had a strenuous day ahead of them, the noise level was a bit too high. But luckily Richard headed over at some point to ask them to calm down a bit, which they did. Midnight, 4700 meters, minus 15 below, barely warmer in the sleeping bag. Jonathan "knocked" on the tent to get us to get ready for the climb. I quickly put in my clothing plus all the layers that I wanted to bring for the day (in order to shed them later on, if necessary), and ate some breakfast and drank some tea, which fantastically our cook had already prepared. I put on the gaiters and grabbed my day pack, which I had prepared the day before. I was the first to be ready and anxiously stood by while the others packed up and got ready. I was hopping from one foot to the other, partly because it was cold, partly because I was nervous, but soon all five of us were ready to go. Richard let the way followed by Tuyu, Matthias and me in changing order. Atenais brought up the back. High up on the mountain we could already see the headlamps of parties that had started earlier. We slowly moved up a gradually inclining slope that changed from a straight trail into switchbacks when it became too steep. We all had headlamps but only used a few because the moonlight was bright enough to illuminate some of the trail. Progress was slow but steady. My head was feeling fine but I was in good spirits but nevertheless appeared to need more rest than the others, at least it was always me bending over trying to catch my breath and thus causing everybody to take a quick break. Interestingly, I had made the same experience on El Misti in Peru, where again it was mainly me huffing and puffing at 5800 meters rather than the German woman or the overweight American that made up our team back then. Hmmm, I appear to be moving find up to 4500 meters (even going that high from sea level in a day, as numerous experiences in the Sierra confirm), but then I appear to be slowing down, relatively speaking. Hmm, an interesting observation. Only one way to test that little theory and that is to do as many high mountains in the future as possible. Ok, we were moving up passing a number of landmarks and also a number of other parties (apparently we were not moving that slowly after all). About 5 hours after setting out we reached the crater rim. It was cold as hell. I had a taken an extra shirt from my backpack and wrapped it around by neck and lower half of my face. My fingers were numb, even though I had them curled up as fists in my gloves. But at least at this point now, at Gilman's Point at 5681 meters, our destination was in sight. However, it was yet another 200 meters of elevation and following the crater rim for a good while before we would arrive at the obvious high point. We took a quick break, but continued soon, because it was simply to cold to be lingering for too ling. Up to this point, we had not seen any ice or snow, but not too far from Gilman's point I found a one meter high piece of pure ice (photo). Quite fascinating, it wasn't white ice, like you find in a glacier, but looked like a gigantic ice cube. I wondered why it was there, just this one chunk and nothing else nearby and especially how long it had been there. Was it the remnant of the glacier? Am I too late (after all it was my goal to see Kili before all the snow is gone)? My questions were partly answered another 10 minutes later on along the trail, when we actually saw the gigantic glaciers on the east side of the summit crater. Atenais had told us about the disappearing snow and glaciers and pointed out the elevations where the glaciers used to be and that were normally snow covered at this time of the year, and even though there was apparently much less now, the sight of the glaciers was still a very impressive one. Sheer walls of ice, maybe 6, 7, 8 meters tall were clearly visible and if I would not have been as cold and tired would have encouraged me to explore them more closely, but we still had to get to the summit and that was the main goal. Inside the crater, it was mainly white because of the snow. About 45 minutes after setting out from Gilman's Point, I noticed that we were actually higher than the smaller and newer crater that had formed in the center of the old crater and that dated to the last activity of the now extinct Kilimanjaro. We placed one step after another onto the gradually inclining slope but eventually after a short rise, saw a number of people ahead of us who had stopped moving. We could also seen a wooden sign, with all sorts of information written on it, one of them begin, that we had just reached Uhuru Peak, the roof of Africa at 5895 meters. We stopped and hugged and exchanged congratulations. It was 6:30 and we were finally there. My first of the seven summits. Yippee. I was tired, but happy. And on top if the sun rose above the horizon and immediately bathed us with its warm beams. Amazing what difference that makes. I was cold just a few minutes ago and now suddenly I felt comfortably warm as if there hadn't been any coldness at all. I took a stroll beyond the sign to a point that was almost as high as the summit but totally secluded for a bit of solidarity and took pictures of the fascinating landscapes. More and more people arrived at the summit, but we still managed to get a nice summit shot of all of us before it become too crowded. Atenais got a thermos with tea out of his backpack and offered us a sip. I hadn't had anything to drink in quite some time and as soon as I had swallowed a few sips of the warm beverage it came right back up and suddenly I found myself retching a few times. Hmmm, nice performance, in front of all these people I thought. Luckily I wasn't the only one who threw up, but still.... I was feeling fine otherwise, no nausea, no headache, but my stomach might have been a bit too sensitive to the sudden contact with the tea. Anyway, needless to say, I felt even better after throwing up. Richard (maybe in response to seeing me) suggested to head down and nobody contradicted him. I stopped on numerous occasions along the crater rim to take more pictures, and eventually was the first to reach Gilman's Point, where I now had Tuyu take a great shot of me with the summit in the background. We took an extended break before beginning the steep descent, this turned out to be not at all bad after all. The terrain was fairly lose, which enabled us to "skate" down and we moved fairly quickly. Richard stopped us shortly below Gilman's Point, because he had found a typical volcanic rock, beautifully dark colored but yet still crystal like structures. I quickly pocketed mine, thanked him and continued down the descent. Eventually, I moved ahead of everybody, even the other parties and barely one hour and a half after setting out from the summit was among the first summiteers to head back into camp. Our porters were sitting on a nearby rock and applauded when they saw me coming. I felt like the winner of the marathon crossing the finishing line. We had done it, a great feeling. It was only 9am, but what a good day's work it had been. Not too long after me, the others petered in. Our tents were still standing and we chilled a little bit, enjoying an energy drink that had also been hauled up by the porters. But that stuff tasted great. We also ate something and then broke tent to be heading down the mountain. We did not take the same route we came up (apparently, that one is restricted to one-way traffic), but headed down the Coca Cola Route instead. 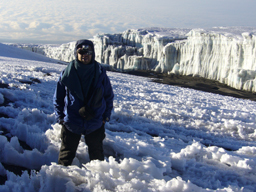 After leaving the Kibo Huts, the trail first aimed at the saddle in between Kili and Mawenzi. We had very nice views of Kili's shorter sister mountain, but then headed right into the general direction of the trailhead. From the trail we often looked back at Kili, taking pictures from this vantage point, which also featured nice views of the glaciers, which we hadn't seen at all on our way up. The British couple was also heading down. They had reached Gilman's Point, before turning around due to general not feeling well and nausea. Despite not having reached the summit they were in good spirits and we chatted quite a bit while walking along the trail. I still understood only about half of what the carpenter from Manchester was trying to tell me, but still had a good time hiking next to them. We encountered a couple of other groups and many porters that were on their way up the mountain. We stopped for lunch in the second camp of the Coca Cola route in a nice grassy shadowy spot, right were the rough mountainous landscape turned back into a more tropical one. In the afternoon we went in and out of the forest, and eventually arrived at camp 1 of the Coca Cola route, where we would spend the night. It was an agglomeration of lots of cabins and tents, busy with dozens of people milling around. One particular feature of this site was that it was near a river and interesting looking plants (photo) were growing along the side of it. They reminded me of a similar looking plant that I had seen in Venezuela and must be from the same family even though the geographic distance was quite substantial. The tents had already been set up when we reached the site, and after an as usual delicious dinner, we went to bed and slept soundly through the night. Both Matthias and Tuyu were also in excellent spirits. For the last time, we awoke to cook's delivery of morning tea to the tent. We took our time enjoying breakfast and relaxed, while most other parties that camped at the same spot were bustling with activity as they still had ways to go up the mountain. We broke camp at about 10 and headed further down the mountain. We were now really entering very forestry area, and some monkeys among other smaller wildlife. Nearly 3 hours leaving camp, we arrived at the trailhead, were we had to sign out at the official entrance and bid farewell to out guides after paying them. If I remember correctly, we paid the guides about 80 Euros each, while the porters got about 30 with a little bit more for the cook. This was a tip in addition to what the tour agency was paying them, but probably exceeded their regular salary by a lot. I also left my gloves with Joseph, a very friendly porter, who did not have any. Then we got back on the bus and headed back to the hotel in Moshi, were - surprise - we again ran into the British couple who were staying at the same place and were relaxing at the pool when we arrived. We also chilled with a few beers at the pool and in the Sauna. At night we went into town to have dinner at an Italian pizza joint (at least they were selling pizza, no idea if they were Italian), and checked out the local barber shop. I wanted to get my beard trimmed and even though shops were closed, we found a place with some people mingling around. They had a blast dealing with the Mzungus and we had a blast talking to them. I also did get my beard trimmed. Afterwards back to the hotel, one last beer at the hotel and off to bed, where we slept soundly. The next day Tuyeni and Matthias had to go back to their respective work places, while I wanted to do a Safari. Thus the three of us drove through Arusha to the little intersection of Makuyuni. We had lunch at a restaurant and then the two left me there. I was hoping I got hitch a ride to the town of Karatu, but eventually I ended up taking public transport, even though it took a while. It was interesting though, because most other people on the bus were Massai. Read the trip reports on the visits to Ngorongoro Conservation Area and Lake Manyara National Park. A couple days later I visited Tuyu in Turiani, the village where she is doing her research, and at the end of my trip I spent a day on the island of Zanzibar.